Nanticoke has its own post-apocalyptic-esque ghost town—the only thing missing is the roving band of marauders. Referred to by some as one of the failed technological experiments in Pennsylvania railroad and coal mining history, and by others as the first example of modern-day cookie-cutter or tract housing, the Concrete City ruins still stand as a monument to the “company housing” living arrangements experienced by some area workers during the late 1800’s and the early 1900’s. Described as “virtual villas” by the upper class of coal mining families, these houses were regarded as a futuristic marvel when first constructed. “Company Housing” in Pennsylvania usually referred to villages comprised of frame-built wooden houses, commonly called “shanties” by county assessors, that were hastily built by industrialist owners for their low-paid employees. By controlling their housing arrangements, employers maintained more control over the lives of their employees and had more opportunity to exploit workers and their families. A great example of this “traditional” company town can be seen at Eckley Miner’s Village, located just 9 miles east of Hazleton, Pennsylvania. Concrete City is “company housing” with an architectural twist. The “city” is a very early example of International Style Architecture which is characterized by buildings with rectilinear forms, unadorned of ornamentation or decoration and constructed with steel, glass and reinforced concrete. This architecture style is a minimalist concept that stresses functionalism. Pennsylvania railroads were using concrete, a novel building material at the start of the 20th Century, on a wide variety of projects. Concrete City was built by the Coal Division of D L and W Railroad for employees of the Truesdale Colliery. The homes, which were built in 1911 and opened in 1913, were rented out to a hand-full of their current employees for $8.00 per month. Called the “Garden City of the Anthracite Region” by its designers, the requirements to be met by employees for residency consideration in this cutting-edge, model worker housing community included English as a first language and employment with the company in a position of “high value” such as mine supervisor, foreman or technician. Concrete City consists of 20 buildings. Each one was a duplex that housed two families. Each half of every single standing structure contained a kitchen, living room and dining room downstairs and four bedrooms on the second floor. Concrete outhouses were constructed behind each house. All of the houses were arranged around a central plaza that was about the size of a football field which contained a pavilion, baseball field and a tennis court. There was a wading pool for children and a waist deep, circular swimming pool with constantly flowing water for adults which are said to be the first in-ground pools built in the Wyoming Valley. The pool was emptied in 1914 after a boy drowned. Concrete sidewalks illuminated by electric lights and landscaped yards completed the futuristic community. Concrete City residents were said to be plagued by dampness because moisture constantly seeped thru the porous concrete which led to condensation on the walls. This is a picture of an item from the archives of the Luzerne County Historical Society. the township in 1924. Ironically, demolition of the modern “Garden City of the Anthracite Region” was halted when it was discovered that the implosion of 100 sticks of dynamite in one of the houses had very little impact. The concept of demolishing the city made of concrete was deemed too expensive, despite the fact that coal was discovered under the site after it was abandoned. Currently, many of the structures exhibit fire damage because the Luzerne County Volunteer Fireman’s Association has used Concrete City as a training center. Despite the fact that it has been designated as an historical site in 1998 by the Pennsylvania Historical and Museum Commission, locals frequently use Concrete City for paint ball games or parties as evidenced by the numerous paint balls and beer cans scattered about the grounds. 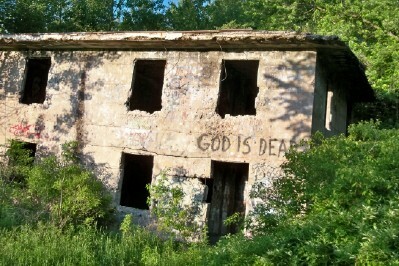 Graffiti covers all of the buildings throughout the entire abandoned community. NEED MORE CONCRETE CITY IN YOUR LIFE? ***And visit Vimeo to watch my Concrete City mini-Movie! I love visiting abandoned places also. Great blog. Great pictures and narratives! Can’t wait to see where you explore in the future! Would love to add this to the list of places we’ve been! Looks very photogenic!! I enjoyed reading this a lot and I really hope to read more of your posts in the future, so I’ve bookmarked your blog. Anyways I hope you keep up the fantastic work! Enjoy your blog very much! Interesting stuff! Can’t believe thats still there. Definately worth the trip! I love the history of this city. When you first posted about it I started looking for more information. Its fascinating, and the pictures are great. I love reading about this old city right in our backyard. I would like to find out how to get to this place to take some pictures. Thanks very much for sharing this post!! An interesting post there mate . Thank you for posting . Very interesting historical piece. Those photos are haunting. I had read a little about the ghost town years ago. But, your blog was MUCH more interesting. Here is a great blog on a true ghost town. Cheri brings this misadventure to life with pictures and HISTORY. excellent! you just gained a new reader.